There are a full range of daylight, tungsten and fluorescent conversions, neutral densities, reflectors and scrims filters. 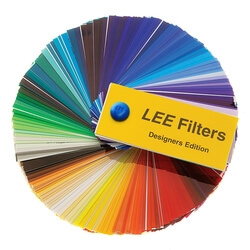 If you would like to figure out which gel sheet would work best with a specific type of lamp or fixture, then you can consult the Lee Filters "mired shift calculator"
LEE Filters manufactures filters for the lighting effects of the stage, TV, movies and photography. Depending on the use environment and preservation condition, phenomena such as discoloration, discoloration and deformation may occur even if strength, usable temperature etc are below the range value. Especially, it is not assumed to use directly attached to the appliance and attached directly to the bulb surface. Also please note that we cannot guarantee the results that were used as far as the warranty is concerned. In addition, fine lines that do not interfere with lighting effects may occur in the manufacturing process. For reasons like the above, returned goods are forgiven. Please acknowledge it beforehand. ※ The color displayed in the catalog is an image. Please acknowledge that it is different from the actual color or the color through light. ※ Filter itself has no stickiness. When pasting on glass etc, please use double sided tape etc sold separately. ※ Please acknowledge the above points beforehand, purchase, please use. ※ In addition, please contact us if you have any questions, questions or anything else. Converts daylight to tungsten light (Transmission= 79.1%) - 21" x 24" sheet. For use on cool white LED with C.T. >6000K to produce a pleasing golden yellow. Similar to LEE 104 on a tungsten lamp. For use on cool white LED with C.T. >6000K to produce a warm primary red. Similar to LEE 105 on a tungsten lamp. For use on cool white LED with C.T. >6000K to produce a warm primary red. Similar to LEE 106 on a tungsten lamp. Good for cycloramas. For use on cool white LED with C.T. >6000K to produce a soft pink red, with strong contrasting shadows. Similar to LEE 113 on a tungsten lamp. For use on cool white LED with C.T. >6000K to produce a fresh crisp spearmint color. Similar to LEE 115 on a tungsten lamp. Good for cycloramas. For use on cool white LED with C.T. >6000K to produce a silvery moonlight wash. Similar to LEE 116 on a tungsten lamp. Good for cycloramas. For use on cool white LED with C.T. > 6000K to produce a silvery moonlight wash. Similar to LEE 117 on a tungsten lamp. For use on cool white LED with C.T. >6000K to produce a cold spine chilling blue. Similar to LEE 118 on a tungsten lamp. For use on cool white LED with C.T. >6000K to produce a soft moody blue, good for backlighting. Similar to LEE 119 on a tungsten lamp. For use on cool white LED with C.T. >6000K to produce a bold intense pink. Similar to LEE 126 on a tungsten lamp.